Although nowhere near as many champions, certainly more medals! 1 Gold, 9 Silvers and 2 Bronze medals is a very impressive haul for a county let alone a single club! To put it in perspective, only 1 further medal was won by a Gloucestershire member and our medal haul was more than the rest of the region put together! (Devon, Cornwall, Somerset, Dorset and Wiltshire). So it is very well done to all those that competed and did themselves and the club proud. 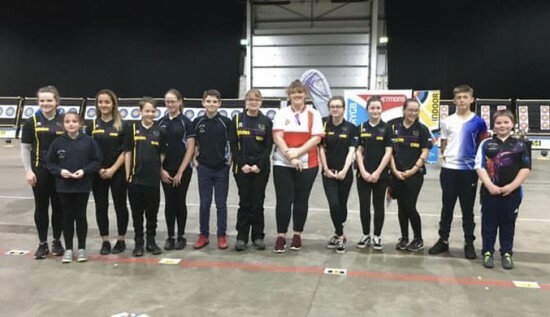 Just some of our team competing at the British Junior Indoor Championships. Molly Peters sporting her England Shirt! 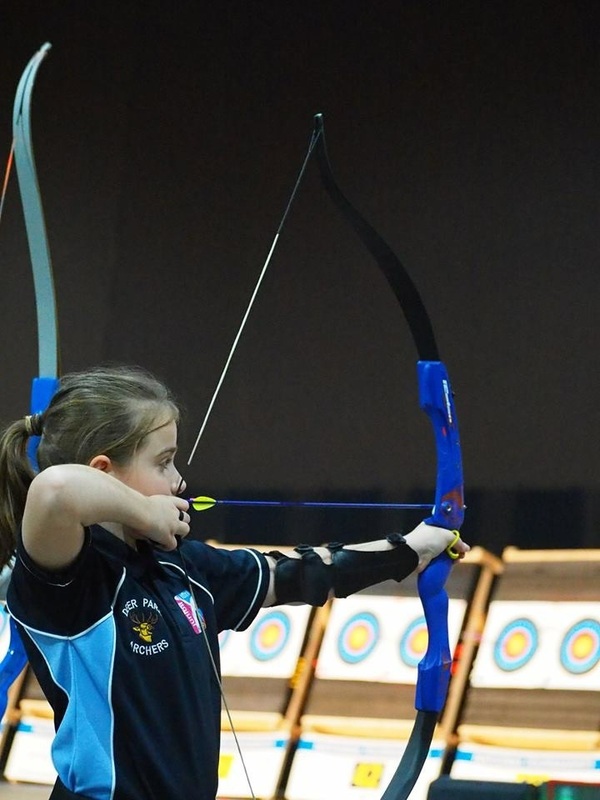 Credit must not only go to the Archers but their parents and their coaches. 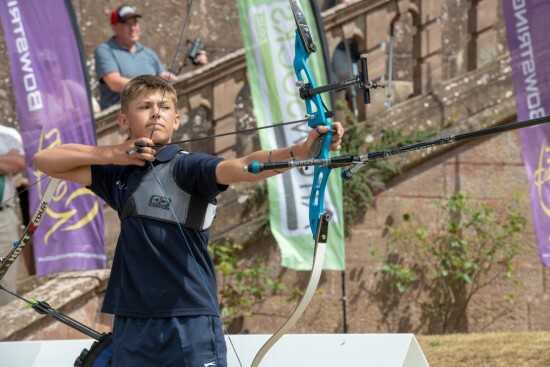 Jack Oram became Overall British Junior Barebow Champion last weekend. 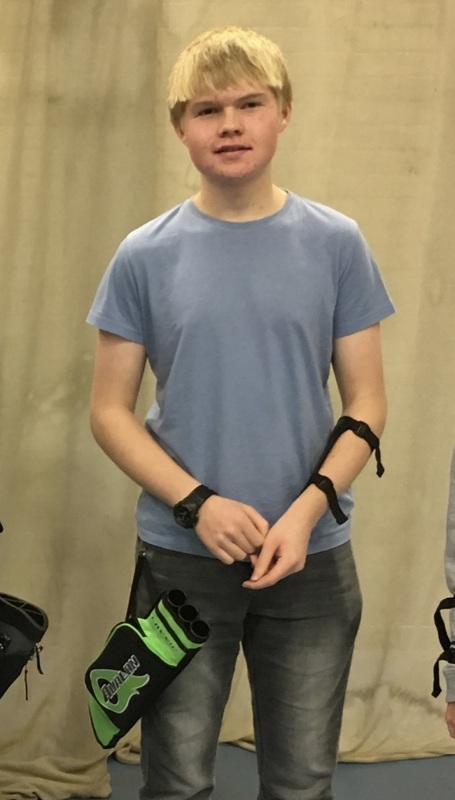 Jack Oram won the British Barbow Under 18 Championships (he is under 16) at his first attempt. Emily Summers finished runner-up in the junior ladies u14 In the same event! Katy Reece only 9 her first big competition. Finished 2nd. Pb and would have come 4th in the under 14s. Katie Reece won silver with a great score in her first big tournament. Tobey Reece again first big shoot, Improved by 17 from last weeks County championships. Josh Uzzell, battled his demons and put in a good score. Definitely back on the up! Ryan Faulkner 3rd under 12. Only 10 years old. Made an astounding improvement over the last 4 months and delivered probably the result of the day! Ryan Faulkner (left) somewhat pleased with his achievement and he deserves to be! Grace Chappell who shot a massive PB of 577 to finish joint 2nd with Holly Clifford in the under 18’s. 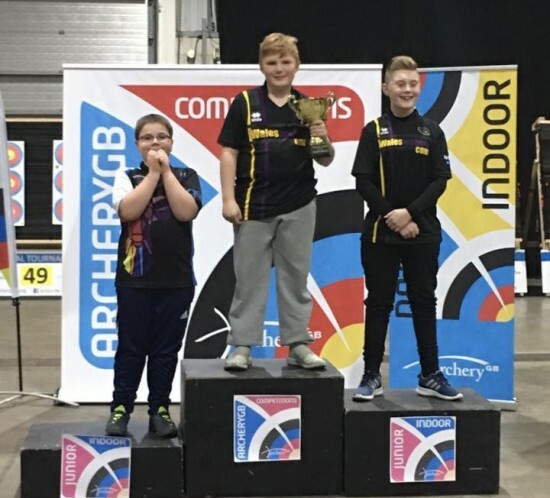 Riley Spencer-Nice, Recurve, who shot an incredible score of 586 to finish runner up, beating Austin Whitmarsh from Cheltenham Archers by just one point, the same outcome as last week in the County Championships! Austin was the only County Archer outside of Deer Park to win a medal, however there were also some good performances from Cleve Archers. Riley Spencer-Nice, great shooting and well deserved silver medal. Molly Peters representing England for the first time and in the very competitive ladies recurve under 18’s section finished 6th not quite on the sort of form we’ve seen in recent weeks. Chloe A,Bear, Imogen Colenut, Emily Summers, Alex Parker and Holly Clifford all won Silver medals and Rosie Preece a well deserved Bronze and her first Championship medal! It was not just the 12 medals achieved but the underlying scores are continuing to improve, so lots of potential to continue to develop! Many of our juniors are also competing in the Senior British Championships taking place today, joining the likes of James Howse, Lucy Mason and Ella Gibson. 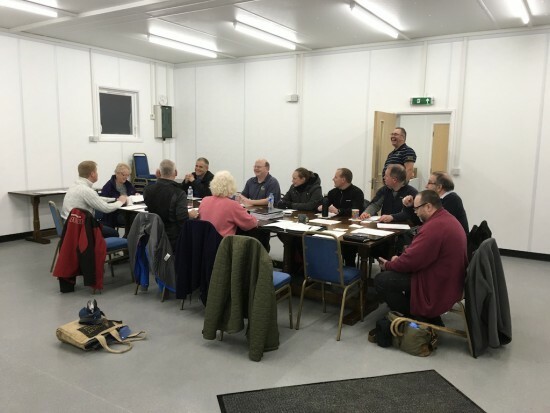 First meeting in our new Clubhouse/Training Centre! Still lots of fixtures and fittings to sort and some snagging issues. Lots of work to do on surrounding paths, ramps and balcony area but plans in place! Thank you to the Royal British Legion for donating a large amount of tables and chairs, it was very timely. First of many meetings using our new facility.